Signal Sorcerer – Why Wait For A Green Light? What you’re looking at here is a Honda Goldwing motorcycle with a special attachment you’re not going to find as an option at any dealership. The Towcycle (probably not its actual name) is capable of a very impressive transformation that would make any Autobot proud. 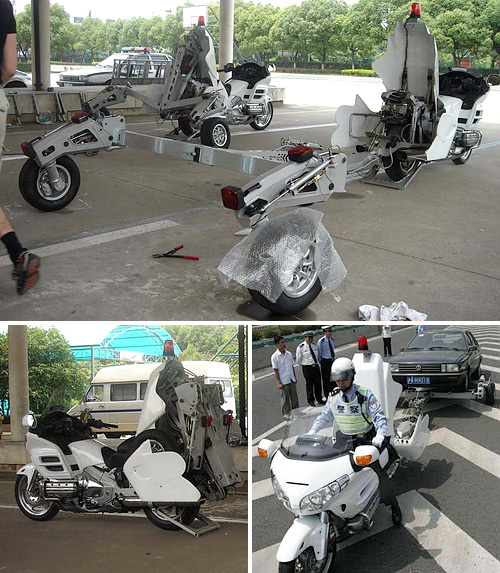 A large mechanism on the back of the bike unfolds via a series of pistons and motors to reveal a trailer that can actually be used to tow cars. Now keep in mind the Towcycle is probably no where near as versatile as an actual tow-truck but apparently they’ve been used in the UK at least where narrow roads can occasionally cause problems for full sized trucks. And while the trailer has its own braking system that is linked to the motorcycle’s brakes the Towcycle can only haul (and safely stop) cars of a certain weight or size. the first car i ever owned was a vw fox. im glad to know that i could’ve been towed by a motorcycle. Coming Through, the manufacturer in Sweden is now bankrupt (Sept 2011).